Documents show National Security Council spent taxpayer money at Trump’s Mar-a-Lago. New documents show the National Security Council spent taxpayer money at Trump’s Mar-a-Lago. 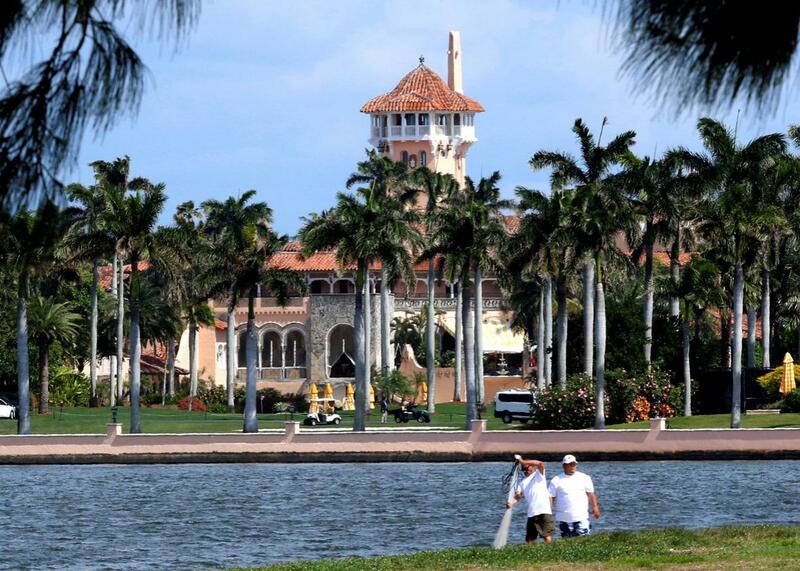 President Donald Trump’s Mar-a-Lago estate in Palm Beach, Florida, as Trump prepared to return to Washington, D.C., after a weekend at the estate, March 5. Since Donald Trump took office in January, his presidency has been dogged by concerns about how he may be profiting off the executive office. Now, thanks to receipts obtained by the transparency group Property of the People via the Freedom of Information Act, there’s evidence that the White House’s National Security Council paid more than $1,000 for a two-night stay at the Mar-a-Lago resort in Palm Beach, Florida, on March 3 and 4 of this year. Trump owns the resort, and the profits are stored in a trust managed by Donald Trump Jr. and Trump Organization chief financial officer Allen H. Weisselberg that the president can pull funds from at any time. As a consequence, these receipts may be evidence of a violation of the Domestic Emoluments Clause of the U.S. Constitution, which prohibits the president from receiving any compensation from federal, state, or local governments beyond the salary he earns as chief executive. On Saturday, March 4, the second of the two days in question, President Trump was seen mingling at a lavish charity ball hosted by the Bascom Palmer Eye Institute at Mar-a-Lago, where he reportedly had dinner earlier that evening with then Attorney General Jeff Sessions, Commerce Secretary Wilbur Ross, John Kelly, former Chief Strategist Steve Bannon, and White House counsel Don McGahn. This was Trump’s third visit to his Palm Beach golf estate since his inauguration in January and two days after Jeff Sessions recused himself from the Justice Department’s investigation into the president’s ties with Russia. Saturday, March 4, was also a prolific day for President Trump on Twitter; he found the time to lodge an unfounded claim that President Obama had wiretapped Trump’s office at the White House and take a jab at Arnold Schwarzenegger’s “bad (pathetic) ratings” on the television show Trump used to host, Celebrity Apprentice. The documents obtained by Property of the People also show that a government travel charge card was used to pay a March hotel bill at the Trump International Hotel in Las Vegas at a cost of $186. Trump himself owns 50 percent of the property. The documents also detail three February charges totaling $62, also paid by government card, at the restaurant at the Trump International Hotel in Washington. The documents obtained by Property of the People further show that the U.S. Embassy paid $632 for four nights in June at the Trump International Hotel and Tower in Panama. Though Trump does not own this property, he collected more than $800,000 in fees from his Panamanian hotel management corporation, which he does own. That $632 bill was paid for with a government travel charge card. For competitive reasons, businesses do their best to keep the specifics of such licensing and management deals private, but court records have shown that Trump has struck deals connected to similar properties in which his payout was tied to the project’s success. In February, the Washington Post reported that the State Department had spent $15,000 to rent 19 rooms at a Trump property in Vancouver shortly after Trump took office. That property isn’t directly owned by Donald Trump but rather by a Canadian company called the Holborn Group. Still, Trump makes money from licensing the Trump brand. According to his 2017 financial disclosure, which covers the period from January 2016 through April 2017, Trump earned $5 million in royalties from the Vancouver hotel. On June 14, the Constitutional Accountability Center filed a lawsuit against Trump for violating the Foreign Emoluments Clause. Sen. Richard Blumenthal, a Democrat from Connecticut, is the lead plaintiff in that suit, and 200 additional members of Congress have also joined the case. The Foreign Emoluments Clause states that anyone holding office in the United States cannot accept any benefit or gift from foreign governments without the consent of Congress. But Congress can’t waive the Domestic Emoluments Clause, according to Gorod. In addition to the Blumenthal lawsuit, the attorneys general of Washington, D.C., and Maryland sued Trump over alleged emolument violations in June. The attorney general of Washington argues that the Trump International Hotel is taking away business from the taxpayer-owned convention center, as foreign embassies are opting to hold events and rent rooms at the Trump hotel instead. The Maryland attorney general likewise says Trump’s D.C. hotel is drawing business out of the state. And in January, the group Citizens for Responsibility and Ethics in Washington filed a lawsuit accusing the president of violating the Foreign Emoluments Clause by accepting money from foreign governments at his Washington hotel. The CREW case is moving forward with oral arguments next month.